The prop insists all excitement of a Lions call-up has been shelved until his team wins a double this weekend. 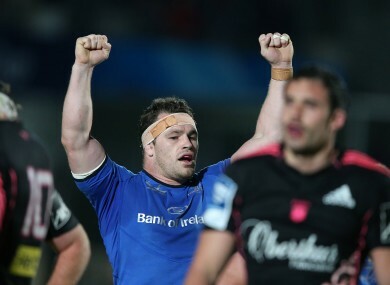 Cian Healy says Leinster are primed for double success. CIAN HEALY IS a player that holds steadfastly to the ‘one game at a time’ doctrine. Getting the prop to talk about the upcoming Lions Tour, for which he has been selected, is not easy but he obliges briefly before swiveling the conversation to Ulster and the Pro12 Final. Ulster, by virtue of their league form, are the designated home team at the RDS on Saturday but Healy is planning a warm welcome. Two defeats in a row to Ulster, and three successive defeats in league finals, have not weakened his position that Leinster are the team to beat. Still, he allows a compliment on Tom Court, John Afoa and Rory Best to pass his lips. Healy declares that the inter-pro opposition, while they are being closely analysed in training and video sessions this week, are not the driving for motivation ahead of the final. A winning-mentality has been established at Leinster and defeats are hard to take. “For Leinster to lose this final would be devastating,” he said. “We’ve lost to them already before [this season] but it doesn’t matter who the opposition is. Losing a final is something terrible and something you don’t want to do. We’ve been working hard to ensure that it doesn’t happen again. Leinster coach Joe Schmidt made no small gesture by inviting young prop Jack McGrath to the post-match briefing after last Friday’s Amlin Cup win over Stade Francais. The invite was a show of confidence on a player that Schmidt confessed to being hard on but only because he sees a future star of the game. Competition for the loosehead position, says Healy, drives him on. As Leinster fullback Rob Kearney alluded to earlier in the week, the three-time European Cup champions may have celebrated last Friday’s cup win with a beer but it was a case of resting the bodies the following day and straight back to work on Sunday. Healy said, We’ve learned in the past that basking in the success of a Heineken Cup win doesn’t help come the next game. This time around we have been pretty clinical in our thinking and how we’ve trained and how we’ve kept that goal in mind. The Ulster defence has been warned. *While Healy is causing havoc in Australia with the Lions this summer, Specsavers will be embarking on a nationwide search, to find Ireland’s most Unbreakable Friendship. Entry forms are available in Specsavers’ 44 stores nationwide. Email “It would be devastating if Leinster lost the Pro12 Final - Cian Healy”. Feedback on “It would be devastating if Leinster lost the Pro12 Final - Cian Healy”.